The Subaru Cherry Blossom Festival utilizes the Horticulture Center to showcase activities with a strong tie to traditional Japanese arts. Indoor events run all day, with exceptions for Ikebana International Philadelphia Chapter 71 and the International School of Shiatsu. 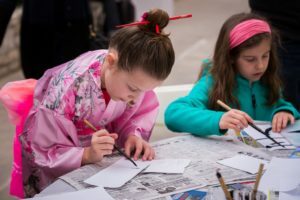 These family friendly events aim to highlight and teach: learn shogi, go, origami, write your name in katakana, and more! Ikebana International, founded in 1956, represents all schools of Ikebana with over 8000 members in more than 50 countries. Ikebana is the delicate art of Japanese flower arranging, with roots in Buddhism and Shintoism. 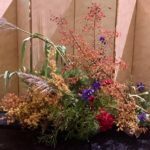 Ikebana is a highly disciplined art form that encourages participants to create arrangements that highlight natural landscapes. Ikebana International Philadelphia Chapter 71 is Philadelphia’s local chapter for Ikebana workshops & demonstrations, including annual exhibits at the Philadelphia Flower Show and Shofuso. Marvel at the intricate arrangements created by Ikebana International #71 at 11:30 AM & 1:00 PM! To learn more about Ikebana, and Ikebana International #71, visit their website or email the chapter here. Started in Langhorne, PA in 1977 and moving to 2016 Plumsteadville, PA, the International School of Shiatsu teach public workshops and career training for Shiatsu enthusiasts and professionals alike. Shiatsu relaxes the body, balances the chi flow, and changes your perspective of life’s challenges. Shiatsu students will offer 10 minute shiatsu samplers, $1 per minute. Proceeds to benefit maintenance of Shofuso. Center yourself with the knowledge that you’re helping preserve Shofuso! The International School of Shiatsu operates from 12:00 PM – 3:30 PM! 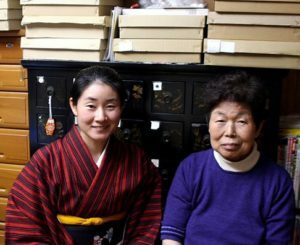 Since she became a certified Kimono consultant of All Japan Kimono Consultant Association after graduating from Sodo Reiho Kimono College in 2007, Rev. Kuniko Kanawa has worked professionally as a kimono model, kanzashi (hairpin) artisan, and certified Shinto priestess. Rev. Kuniko Kanawa offers kimono-centric dressing services, photo shoots, workshops, lectures, fashion shows, and more. In 2015, Rev. Kuniko Kanawa became a certified Shinto priestess through Ama-no-Iwakura-Jingu, the independent Shinto shrine in Horoshima prefecture. If you’re curious about wearing kimono, a traditional Japanese garment, Rev. Kuniko Kanawa will offer kimono dressing services all day. To find out more about Rev. Kuniko Kanawa’s wide range of services, from attending a kimono dressing class to purchasing kanzashi, kimono fabric, and Chiyogami paper visit her website. Come learn to write your name in katakana, a component of the Japanese writing system. Or, learn how to write select cherry blossom themed kanji! Greater Philadelphia Paper Pholders (GP3) is a group of paper folders located in Wynnewood, PA. GP3 meets on the first Monday of every month at St Paul’s Evangelical Lutheran Church in Ardmore, PA. Members are encouraged to bring in their own models and teach the group. Membership is free and available to people of all ages and skill levels. 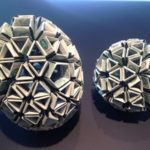 If you’re interested in origami and other methods of paper folding, check out GP3’s demonstrations all day! To find out more about Greater Philadelphia Paper Pholders visit their website. The Penn Go Society is a chapter of the American Go Association that meets every Wednesday in University of Pennsylvania’s Houston Hall. Go is a grid-based board game invented in China thousands of years ago in which players compete for space using black and white pieces. A game that is easy to learn and hard to master, Go rewards patience and lateral thinking. With a system of handicaps that allows players of all skill levels to play against one another, the Penn Go Society welcomes beginners! Learn the ancient Chinese game of Go. Games and instructors available all day! To find out more about the Penn Go Society, visit their meetup page here. 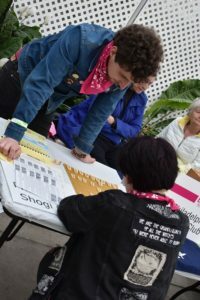 The Swarthmore Shogi Club is a student-run organization at Swarthmore College that offers weekly meetings for Shogi enthusiasts. Shogi, or the Game of Generals, is a Japanese board game, similar to chess. However, while they are both games of strategy and skill, the historical development of Shogi was not influenced by the western style of chess. With objectives and pieces unique to Shogi, the game has a distinctly different feel than western chess. Beginners welcome! Learn Shogi, the variant of chess popular in Japan, with instructors available all day! 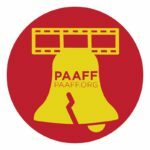 Philadelphia Asian American Film & Filmmakers (PAAFF) is a nonprofit organization founded in 2008 to educate and expose the Philadelphia region to films by and about Asian Americans primarily through an annual film festival as well as year round events. In the decade since its inception, PAAFF is proud to have presented dozens of culturally relevant films and exciting programming to broad and diverse audiences from Chinatown to Center City to University City. Chanoyu or chado, known in the west as Japanese tea ceremony, is a blend of hospitality, performance art, meditation practice, and social event. Through workshops, lectures, demonstrations, and classes, Urasenke Philadelphia brings chado to the greater Philadelphia area. Each month, Urasenke Philadelphia perform public demonstrations at Shofuso. 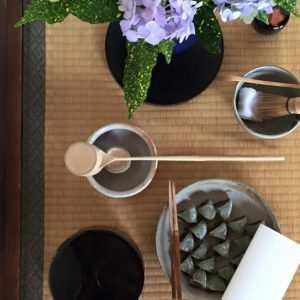 For those interested in learning Japanese tea ceremony, Urasenke Philadelphia holds lessons at Shofuso. Looking to participate in a chanoyu demonstration? Take a seat and have a sweet at the Sakura Pavilion! Demonstrations run throughout the day. To learn more about Urasenke Philadelphia, visit their website and check out their facebook page. To register for lessons, click here.